The Flock earth observing constellation built and operated by Planet Labs (formerly Cosmogia Inc.) consists of numerous triple CubeSats. The Flock-1 and Flock-1b constellations consist of each 28 satellites in medium inclination orbits. The Flock-1c constellation features 11 satellites in longer lived polar orbits. The majority of the satellites featured a standard RGB imaging system, but five satellites were fitted with experimental systems working in different optical spectral bands. 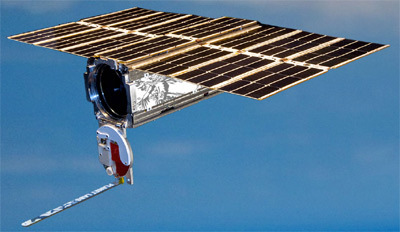 Planet Labs satellites each carry a telescope and a frame CCD camera equipped with Bayer-mask filter. The CCD sensor converts filtered photons into electrons, which are then amplified in order to produce a digital number corresponding to each pixel in each band. Planet Labs has flown three generations of optical instruments: Planet Scope 0 (PS0), Planet Scope 1 (PS1), and Planet Scope 2 (PS2). Images have different attributes depending on satellite altitude and instrument type. PS0 features a 2 element Maksutov Cassegrain optical system paired with an 11MP CCD detector. Optical elements are mounted relative to the structure of the spacecraft. PS1 features the same optical system as PS0, aligned and mounted in an isolated carbon fiber/titanium telescope. This telescope is matched with an 11MP CCD detector. PS2 features a five element optical system that provides a wider field of view and superior image quality. This optical system is paired with a 29MP CCD detector. The first launch, the Flock-1 constellation consists of 28 satellites. Leveraging on the Dove 1, 2, 3 and 4 prototypes, the 28 Flock-1 satellites were launched as piggy-back payloads on a single launch on an Antares-120 booster, which lofted the Cygnus CRS-1 transporter towards the ISS, where they were deployed from the Kibo airlock by Nanoracks deployers. The satellites provide imagery with a resolution of 3–5 m and operate in a relative short-lived 400 km Orbit with an inclination of 52°. The first four were deployed on 11 February, two more followed the next day with two more postponed. The 4th pair, delayed by a deployer issue, was released on 13 February. The 5th and 6th pairs followed on 14 February and the 2 delayed pairs on 15 February. Deployment of the second batch started with a pair on 25 February, two pairs on 26 February, two pairs on 27 February and the final pair on 28 February. In March 2014 Planet labs announced, that they will launch 100 more satellites within one year, using both US and Russian launch vehicles. 28 Flock 1b were launched in July 2014 on the Cygnus CRS-2 mission and will also be deployed from the ISS in short-lived 400 km Orbit with an inclination of 52°. The first pair was deployed on 19 August. Six of these satellites, Flock-1b 3, 4, 13, 14, 19 and 20, were returned to Earth after 212 days in space aboard Dragon CRS-5 without having been deployed. The 11 Flock 1c satellites operate in an orbit of approximately 620 km circular altitude and 97.98° inclination. They were launched by a Dnepr rocket in June 2014. The 26 Flock 1d satellites were lost in a launch failure on the Cygnus CRS-3 mission, when the launch vehicle exploded shortly after lift off. They were to be deployed from the ISS in short-lived 400 km Orbit with an inclination of 52°. The 2 Flock 1d' replacement satellites were manifested on short notice on the Dragon CRS-5 mission in early 2015 to be deployed from the ISS in short-lived 400 km Orbit with an inclination of 52°. They were deployed on 3 March 2015. 14 Flock 1e satellites were launched on the Dragon CRS-6 mission in April 2015 to the ISS. The first pair was deployed on 13 July 2015 and the last one on 16 July 2015. Another batch of 8 Flock 1f satellites was launched on the Dragon CRS-7 mission in June 2015 to the ISS, but was lost, when the launch vehicle failed. A Batch of 14 Flock 2b satellites were launched in August 2015 onboard of HTV 5 to the ISS. Deployment began on 5 September 2015. Two satellites were not deployed due to problems with the deployer and were likely returned to earth. The Flock 2e batch consisting of 12 satellites was launched on 6 December 2015 on board of Cygnus CRS-4 to the ISS. Deployment began on 17 May 2016 and was finished on 1 June 2016. Another 20 satellites, called Flock 2e' were launched on board of Cygnus CRS-6 on 23 March 2016 to the ISS. Deployment of the first twelve began on 17 May 2016. The deployment of the remaining eight began on 14 September 2016. Twelve Flock-2p satellites were orbited by an Indian PSLV-XL rocket on 22 June 2016. A very large batch of 88 Flock-3p satellites was orbited by an Indian PSLV-XL rocket in February 2017. Another large batch of 48 Flock-2k satellites was orbited by a Russian Soyuz-2-1a Fregat-M rocket in July 2017. One of these satellites did possibly not deploy. Four Flock-3m satellites were orbited by an US Minotaur-C-3210 rocket in October 2017. Four Flock-3p' satellites were launched on 12 January 2018 on a PSLV-XL, which are used as technology demonstrations for improvements of the satellite subsystems, including camera technology, thermal control, and altitude determination and control system. At least one satellite carried a FEEP thruster. A single satellite called Dove Pioneer was launched on the second launch of the Electron KS vehicle on 21 January 2018. Sixteen Flock-3r satellites were launched in November 2018 on a PSLV-XL. Three Flock-3s satellites were be launched in December 2018 on a Falcon-9 v1.2 (Block 5). Twenty improved Flock-4a satellites are to be launched in April 2019 on a PSLV-QL. In July 2016, three dedicated launches on Electron KS rockets were ordered. Each of the rockets will carry 20 to 25 satellites.